with my decision to start climbing, I'm also in need of some carabiners to secure gear to my climbing harness; and as I am also pondering hammocks at the moment, they could get used as a hardware solution to attach the the hammock's suspension with the tree straps. 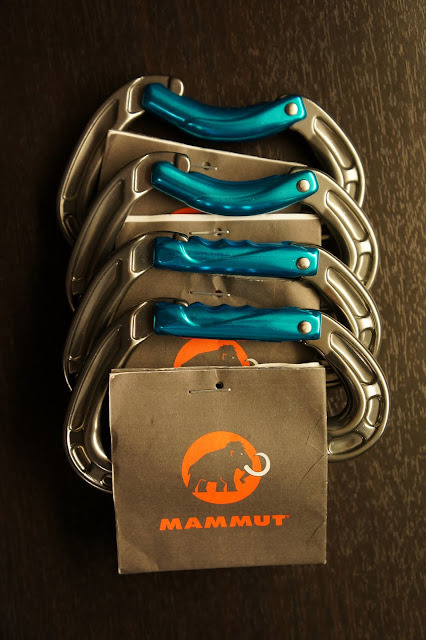 Mammut, the Swiss company which makes mountaineering and climbing equipment since a long time, make the Bionic Evo Key Lock carabiner, which should be perfect for my needs. It has a high breaking load capacity while being very light, and its nice colour also means it is easy to see in case it drops on the forest floor or when rock climbing. If you would drop a few in my stockings, I will make sure that a nice apple pie is waiting for you next year! Leave a comment and tell for what you're going to use these carabiners - you got till 18 o'clock! And the winner is... Tomás - Congratulations! Please contact me via Email, you got till tomorrow 15 o'clock to get in touch otherwise it goes to the second in line! Thanks everyone else, see you tomorrow at 6 AM!